Vivek Pradeep manages the computer vision team at Applied Sciences. He received his Ph.D. degree from the University of Southern California, Los Angeles in 2011 where he worked on a wearable SLAM system. Prior to that, he received his undergraduate degree in Electronics and Communications Engineering from the Indian Institute of Technology, Roorkee. He has also worked as an intern at the Honda Research Labs, Mountain View developing algorithms for the ASIMO robot’s visual navigation system. 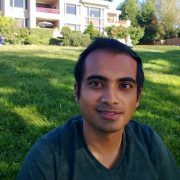 Vivek’s research interests are in the areas of visual odometry, SLAM, 3D reconstruction, camera calibration and machine learning. At Microsoft, his responsibilities include iterating on efforts related to scenario exploration, sensor and optics design, systems integration and algorithm development for various shipping and explorative vision-based products across the devices family.